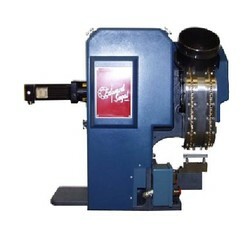 The Edward Segal, Inc. Model 83HS High-Speed Eyelet Machine incorporates many state-of-the-art design features. This machine has been designed for assembly line applications, and offers substantially increased eyelet attaching speeds and reduced maintenance requirements. The 83HS is servo-powered, an innovative arrangement that completely eliminates the flywheel and clutch components. The standard 83HS has a cycle rate of approximately 0.1 seconds. This compares favorably to the Model 83, which completes a cycle in approximately 0.5 seconds, including the time to actuate the electro-air trip. Operator safety can be substantially improved with the 83HS. The servo motor does not operate as a full revolution press and, by integrating other safety devices such as a light curtain, the 83HS can be stopped at any point in the cycle if the safety area is violated. To reduce the operator time required to monitor the 83HS, Edward Segal, Inc. also offers a bulk hopper loader for the eyelets. The bulk hopper loader has sufficient capacity to refill the hopper at least twice for most of the standard eyelets. Current users of the Model 83 will find it easy to upgrade to an 83HS machine since both models share a common footprint. For more information to determine if this machine is suitable for your application, please contact our Machinery Sales Department.